J. Murray Logan’s connection with Camphill Village began in 1994 when his and Mary Power Logan’s daughter, Miss Maria Charlotte Logan, chose to make her home in the Village. Camphill Village has chosen to honor the late J. Murray Logan, whose visionary bequest led to the creation of the Camphill Village Copake Foundation, chartered to support the work of Camphill Village. 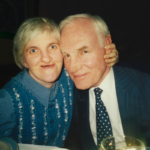 The Legacy Circle has been founded to recognize and honor donors who, like Mr. Logan, make future gifts to the Foundation, ensuring that people with developmental disabilities have the opportunity to live full, meaningful and productive lives. The J. Murray Logan Legacy Circle is also honoring Mary Power Logan and their daughter, Miss Maria Charlotte Logan, as founding members. Membership in the J. Murray Logan Legacy Circle involves no obligations or dues. Its sole purpose is to thank and recognize you for including the Camphill Village Copake Foundation in your estate or trust plans. Periodically, the Foundation will recognize Legacy Circle members by inviting them to recognition events and listing their names in Camphill Village publications, donor lists, and the donor recognition wall in the Bluestone administration building. Of course, we always respect a donor’s wish to remain anonymous. Donate any other gift to be realized at some future date, such as a life insurance policy or retirement plan.